A lot of my little friends have new baby siblings so I thought it would be nice to do a storytime celebrating all things baby related! 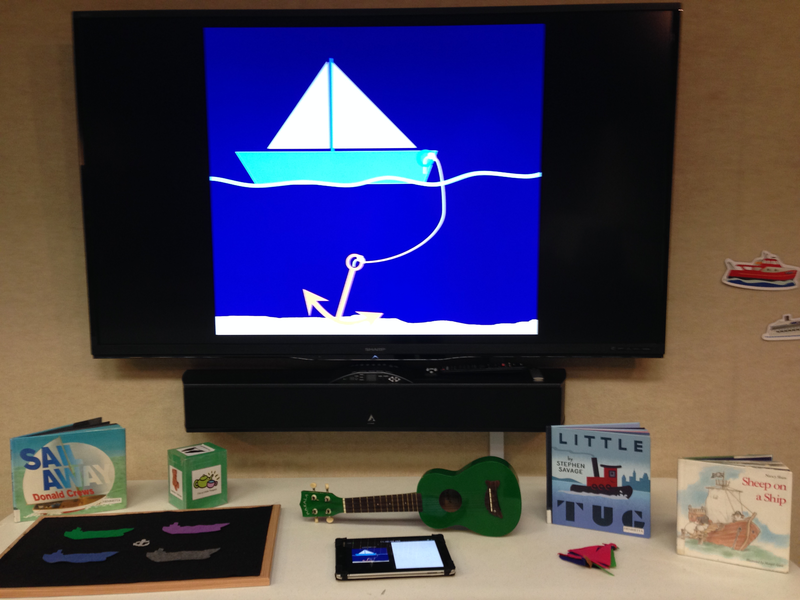 Welcome song: I played this song on my ukulele and used my iPad and Apple TV to project the lyrics. Sign Language: We learned the sign for “baby” and repeated it often. I created various baby faces based on ones I found at Mel’s Desk. 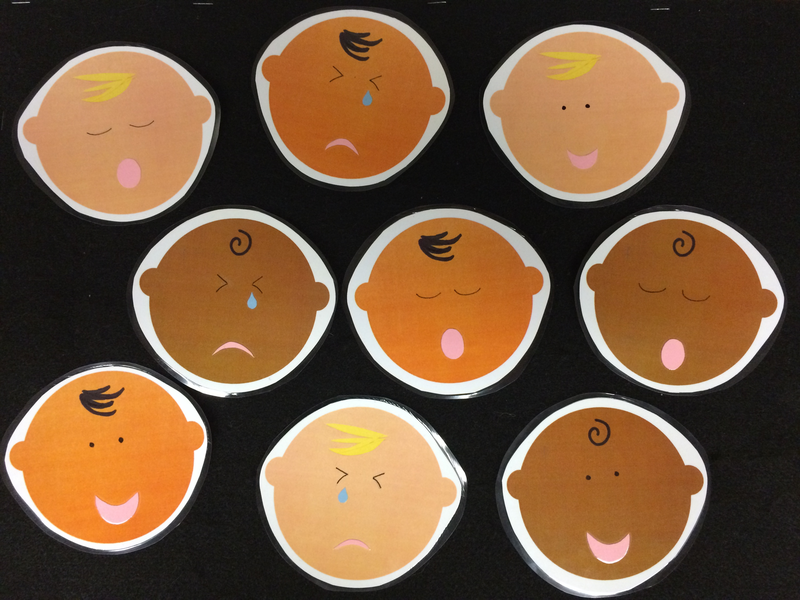 I made a bunch of smiling faces, a bunch of sleepy faces, and a bunch of cranky faces. 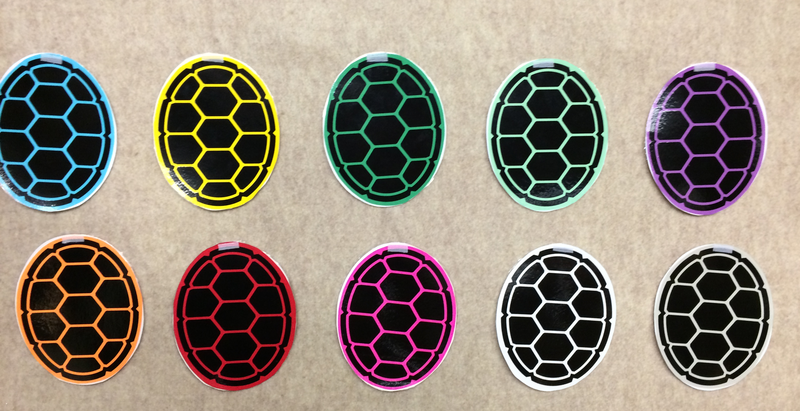 Next I laminated them and put a small piece of velcro on the back. During storytime I handed each child a face and asked them to show their grown-up (this is my trick for 1. getting the grown-ups involved and 2. having the grown-ups help their little one wait for his/her turn). Next we sang the following song and the kids who had the corresponding face could come up and put the baby face in the “crib” (i.e. stick it on the felt board). I handed out rattles (maracas) to each child and reminded them that babies love to shake rattles. We shook our rattles along to the song “Run Baby Run” by Casper Babypants. 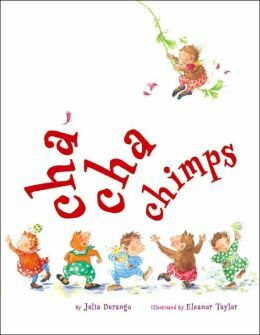 This song has a bunch of motions for the kids to do (run, jump, spin, clap,…) so it’s perfect for storytime! Goodbye Song: I played the “goodbye” version of our welcome song on the uke and projected the lyrics. It’s a new song so my hope is that the kids will start to learn the words and join in. Unitl then, I’m relying on the parents to drown out my voice! Rhyme Cube: Click here for description. Sign Language: We learned the sign for “quiet” and repeated it throughout storytime. One said HIYAH, and then there were four. One said HIYAH, and then there were three. One said HIYAH, and then there were two. 2 little ninjas, having so much fun. One said HIYAH, and then there was one. 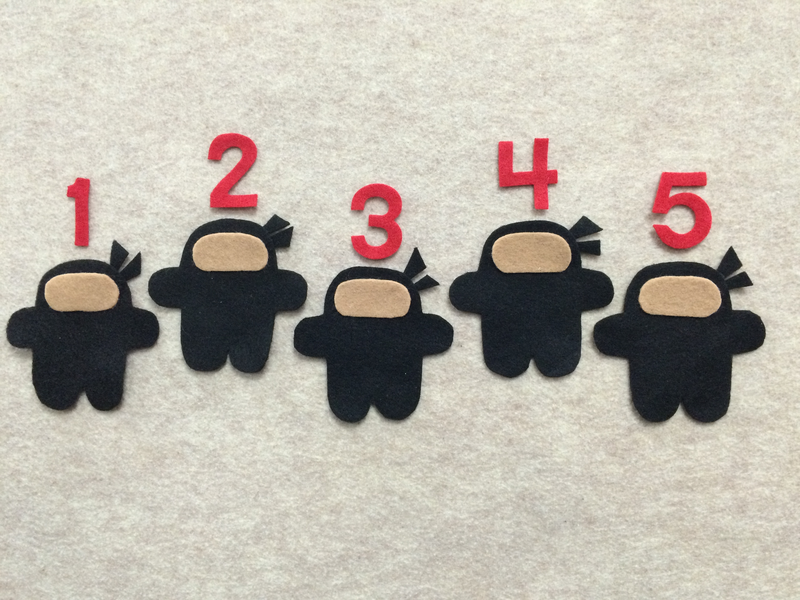 1 little ninja, on the run. He said HIYAH, and then there were none. Ninja, ninja – sneak around. 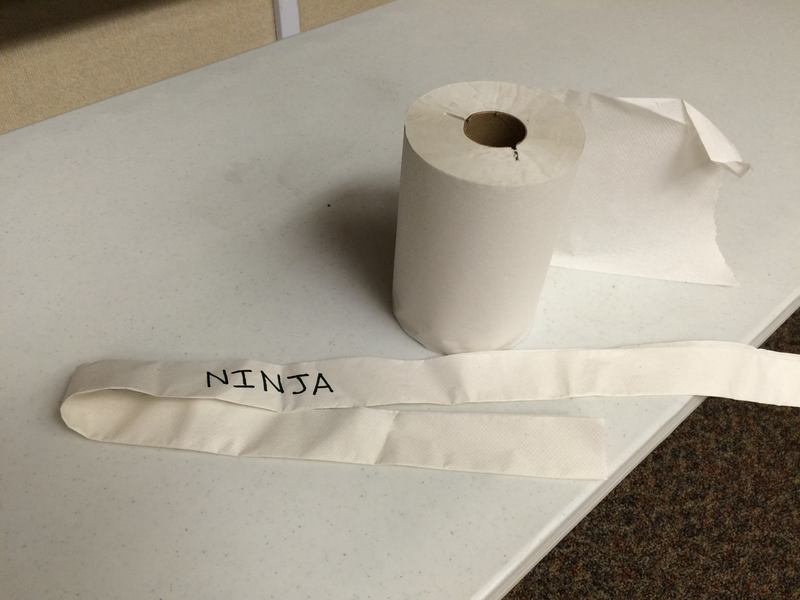 Ninja, ninja – roll on the ground. Ninja, ninja – climb up high. Ninja, ninja – touch the sky. Ninja, ninja – jump down low. Ninja, ninja – touch your toe. Do you see a ninja? I do. 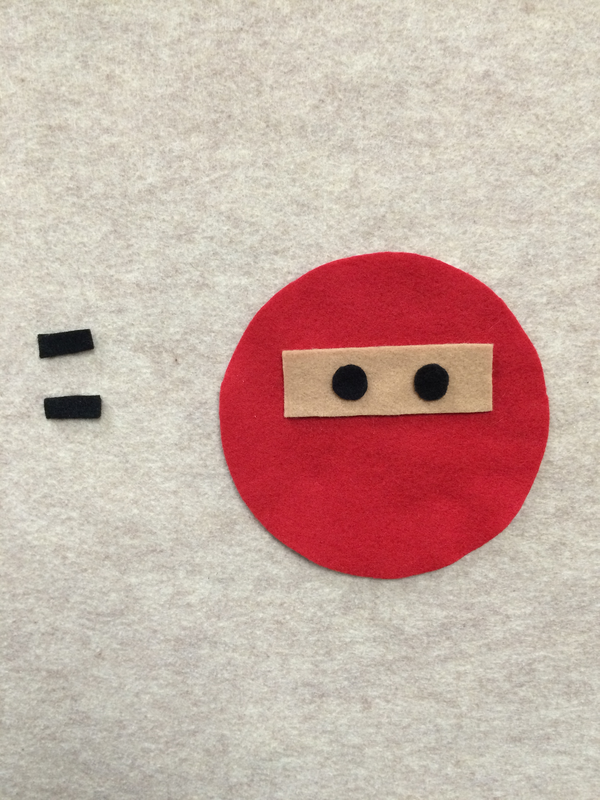 To make a ninja, first we need a head. 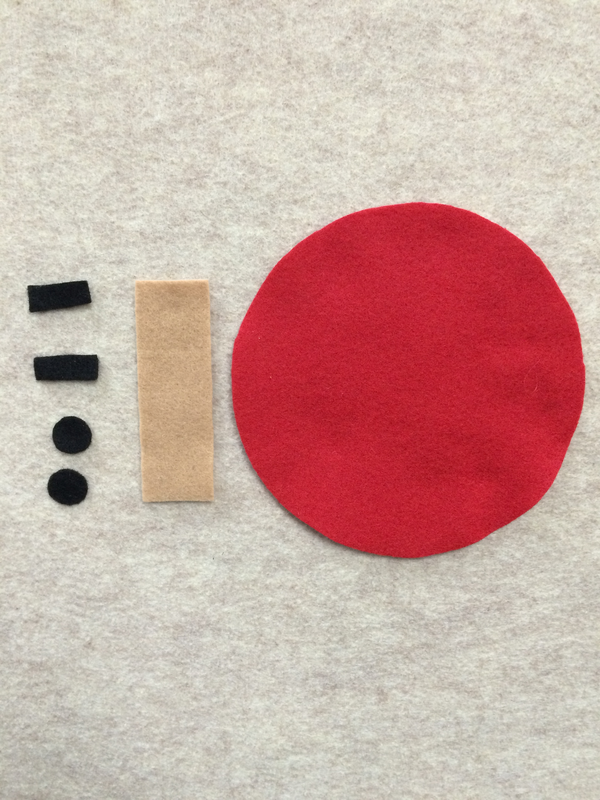 This one is round and red. Just big enough for a peeking out face. 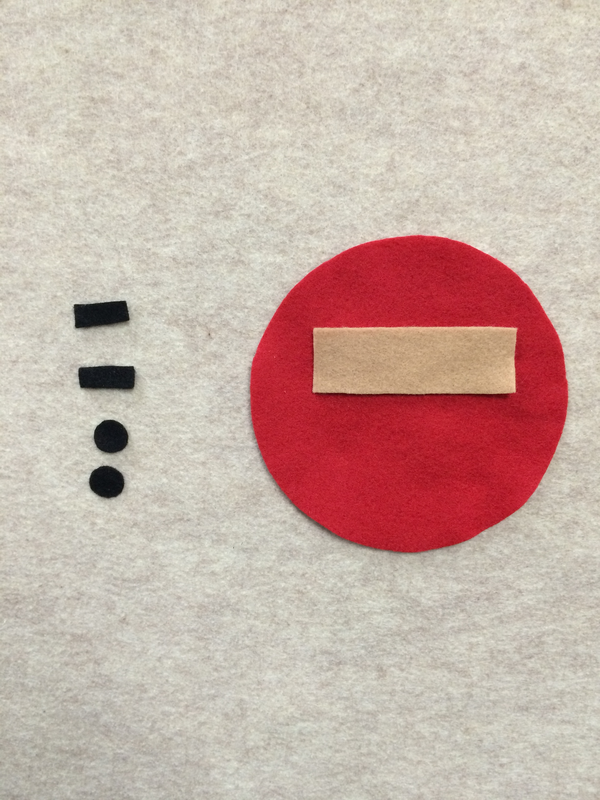 And two tiny rectangles, to make our ninja look surprised! Song: If You’re a Ninja and You Know It! I asked the kids which color card I should turn over and we played the memory game until we found all the matches. 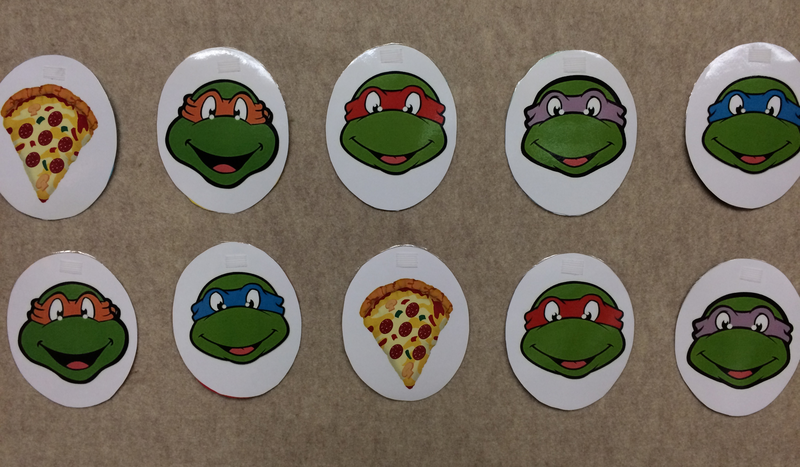 I wish I had written the names of each ninja turtle under their faces but didn’t think of that until after I laminated them. Oh well. 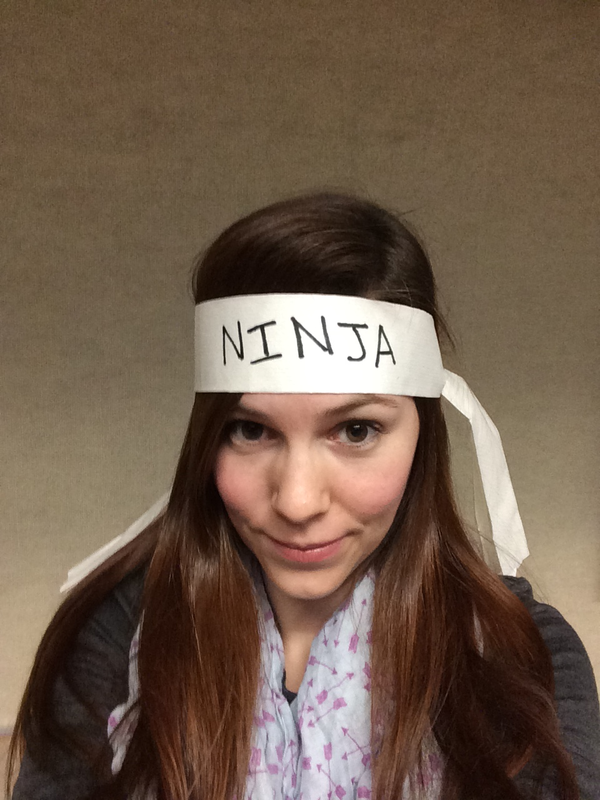 Another idea I thought of after the fact: I created simple ninja head bands out of paper towels. 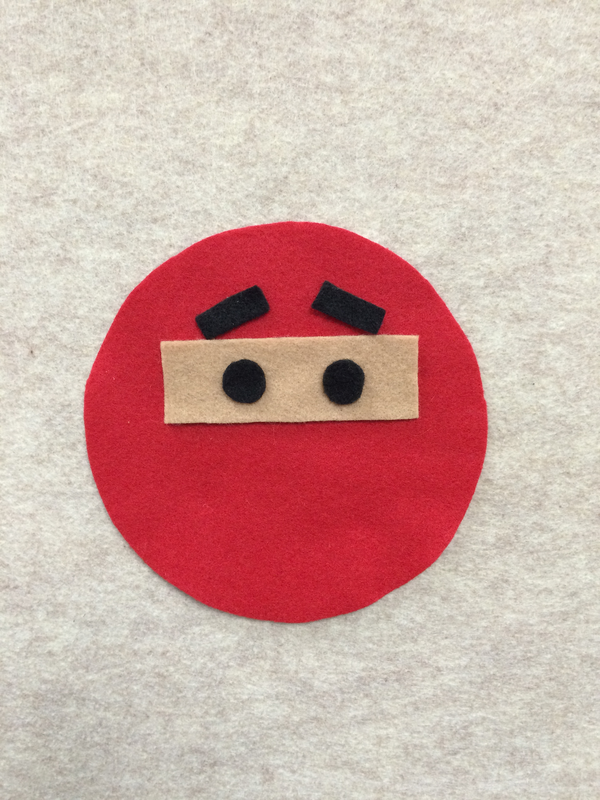 Next time I do a ninja themed storytime I’ll give one to each kid at the start so we can pretend to be ninjas! 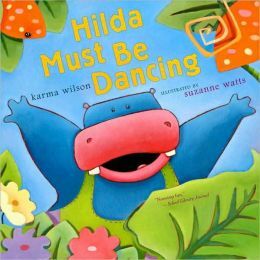 Sign Language: We learned the sign for “Dance” and repeated throughout the storytime. I printed out the List of Dances on brightly colored cardstock. Next, I cut out and laminated each type of dance and put a piece of velcro on the back. 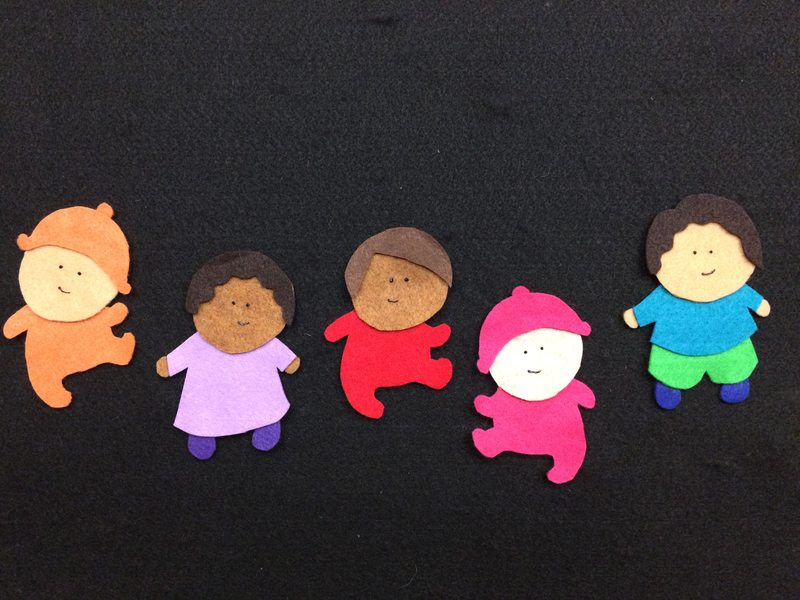 During the activity, I stuck each laminated card on the felt board and showed the kids how to do that dance. When I played the song, I pointed to each dance as we did the motions. 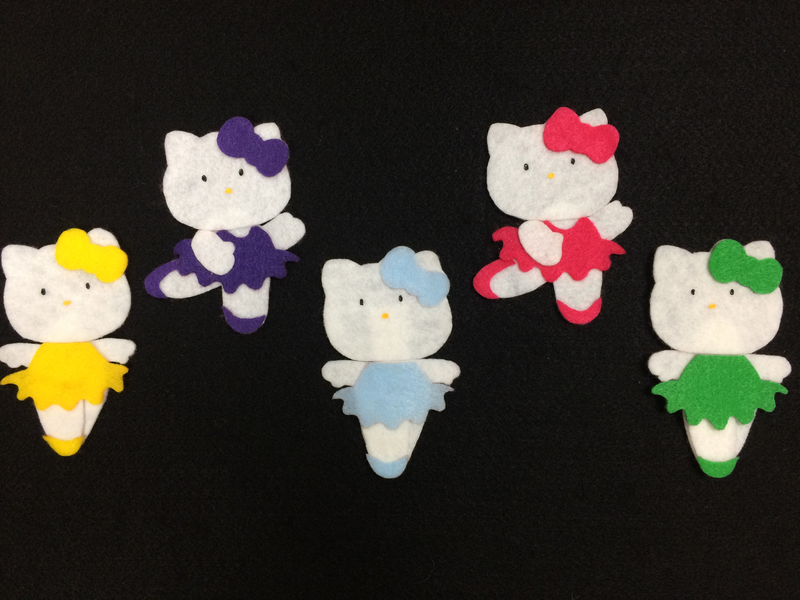 One twirled away and then there were 4. One leaped away and then there were 3. One danced away and then there were 2. One twirled away and then there was 1. I gave the kids shakers and we danced along to the Silly Dance Contest. This is one of my favorite songs to use in storytime because it has moments when the kids have to freeze until the music starts again. And then they can dance like crazy again! I love the music CD’s by The Learning Groove (Mr. Eric is Eric Litwin. Yes, THE Eric Litwin of Pete the Cat fame). 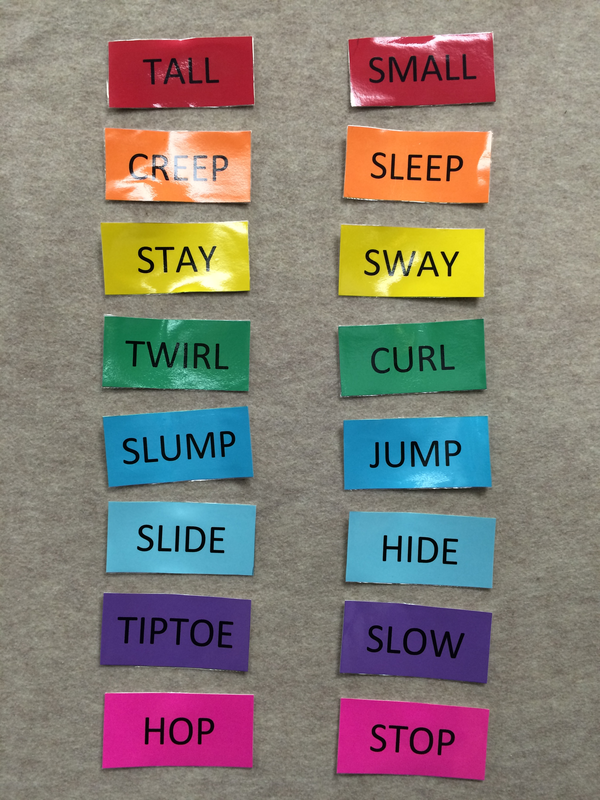 I use them frequently in my storytimes and Music and Movement programs. Each of their six CD’s include a great welcome/hello song to the tune of Skip to My Lou (and a goodbye version to the same tune). 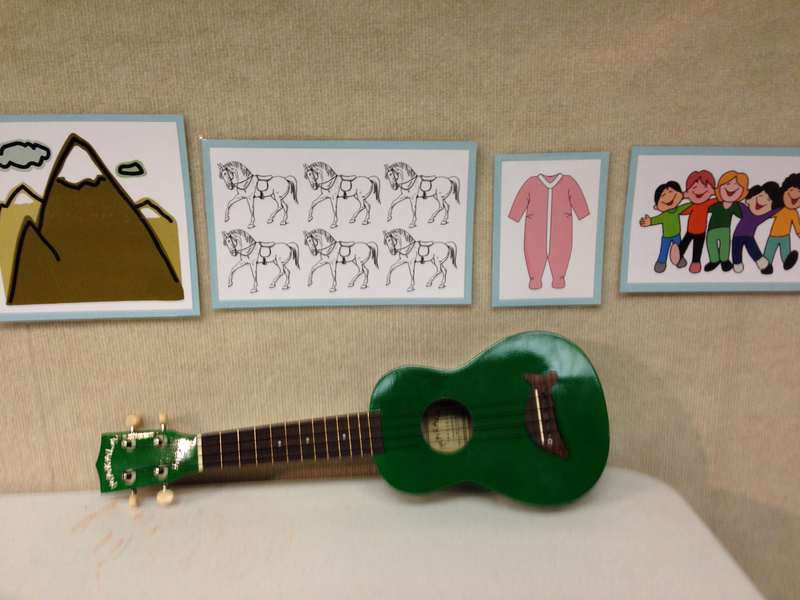 I wanted to incorporate the song into my storytimes using my ukuele but had to change the words a little to make it more library-themed. It’s time to read a book or two! Hello children, how are you? Hello grown-ups, how are you? I’m fine, hope you are too! Now let’s read a book or two! Hope you take a book or two! My next session of storytime starts in a week and a half and I plan on trying out my new hello/goodbye songs….guess I better start practicing! So I finally have the equipment to do digital storytelling! Thanks to a generous donation from our Friends group we were able to purchase a 70 inch flat screen TV and an Apple TV. The Apple TV lets me wirelessly mirror whatever is on my iPad to the TV. I had a few issues getting everything set up. Even though we have a staff-only wifi network, it was too congested and apps ran slowly/stuttered when I mirrored them. I decided to use my iphone as a hotspot and connected both the Apple TV and the iPad to that. It was an easy fix! Byron Barton’s book apps developed by Oceanhouse Media are awesome so I used this as an opportunity to recommend them to the grown-ups in the room. 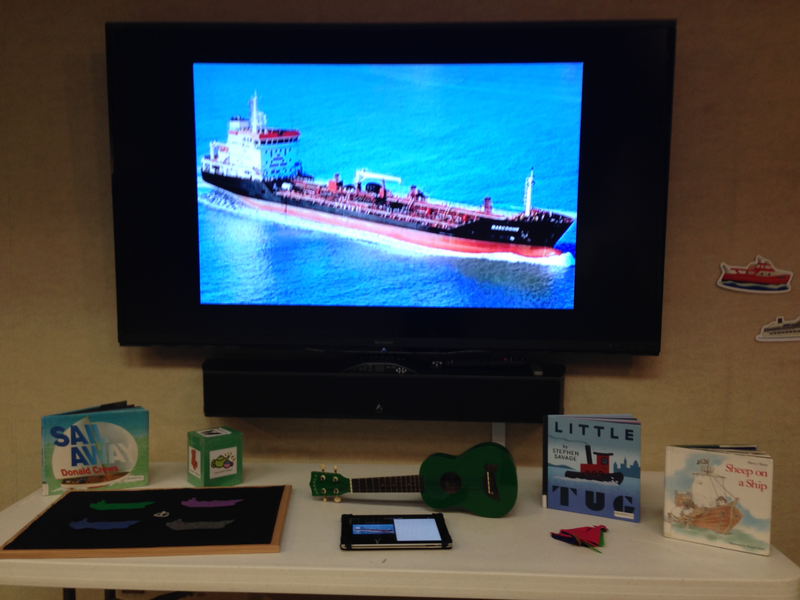 Today was a great day to use the Apple TV because I had about 60 people at storytime. Mirroring it to the TV made what would have been a 10 inch by 8 inch book into a 4 foot by 3 foot book! 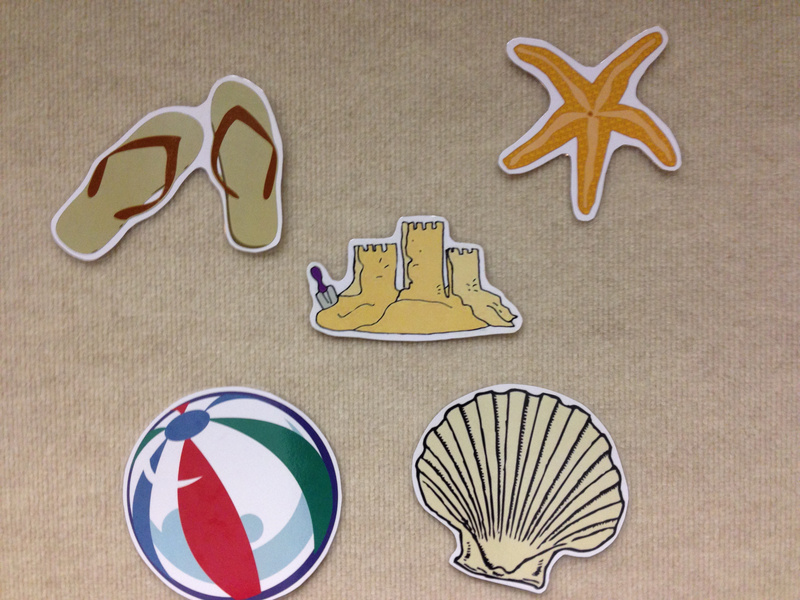 I got the idea for this felt board (and the clip art!) from Sunflower Storytime. 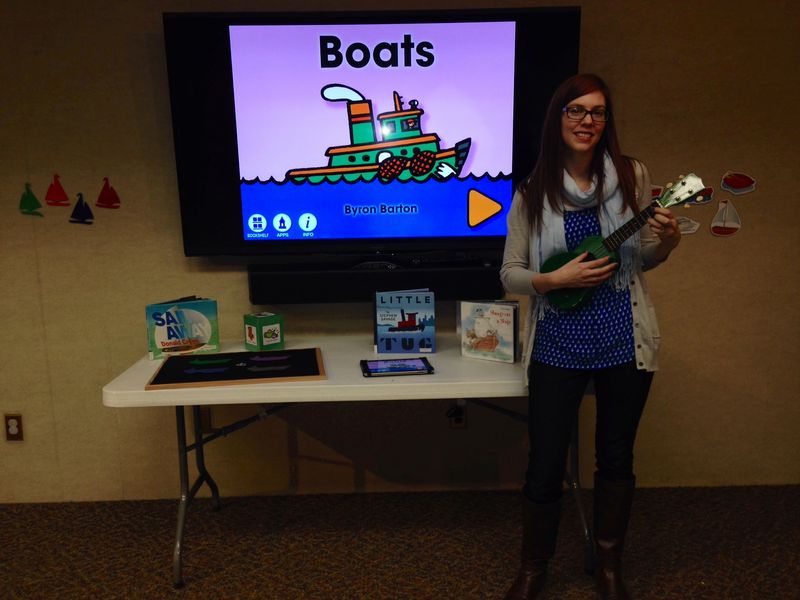 “The first little boat went chug, chug, chug. The second little boat went tug, tug, tug. The third little boat went row, row, row. The fourth little boat went oh sooo slooooow. 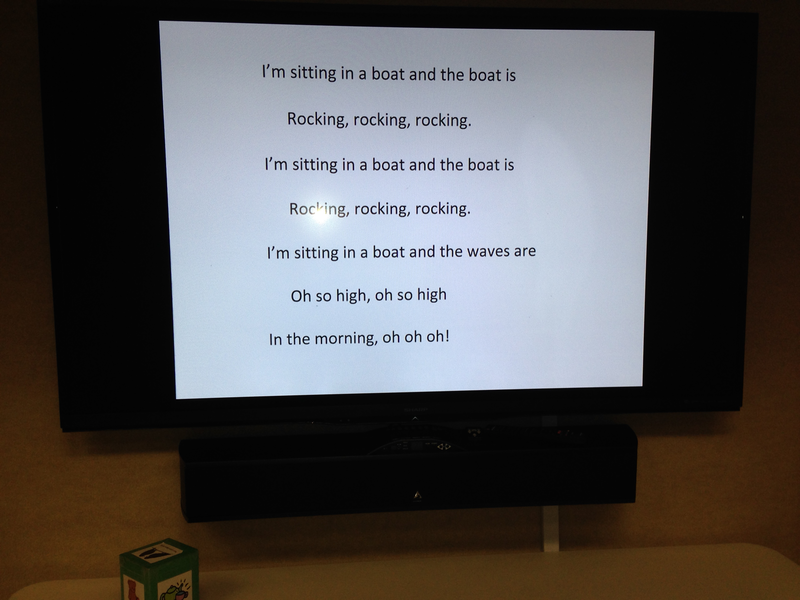 “I’m sitting in a boat and the boat is rocking, rocking, rocking. I’m sitting in a boat and the boat is rocking, rocking, rocking. 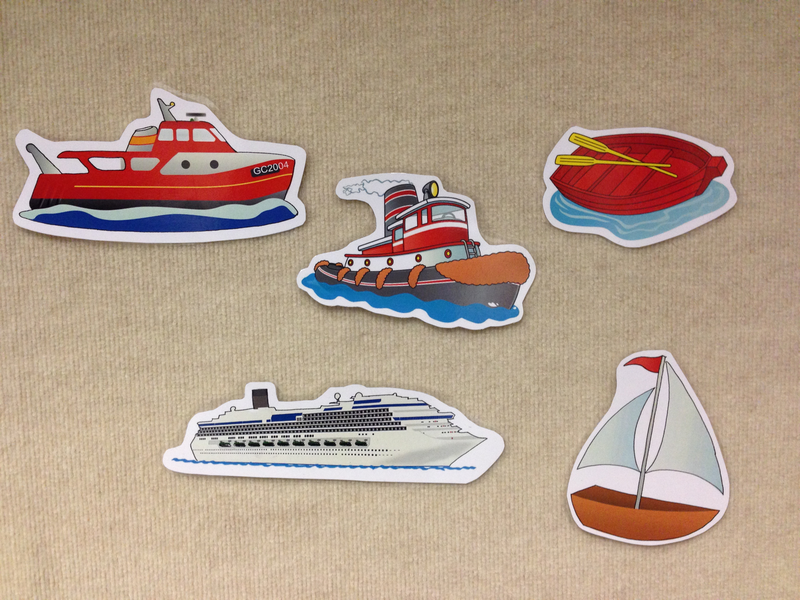 Next I planned on doing a felt board activity with the kids involving an anchor and some oil tankers. Those are pretty big words so I thought I’d use the iPad to show some images and expand their vocabularies and background knowledge! I used the Keynote app for this too. First I showed a picture of an anchor and briefly explained how they work. I got this idea from Storytime Katie. 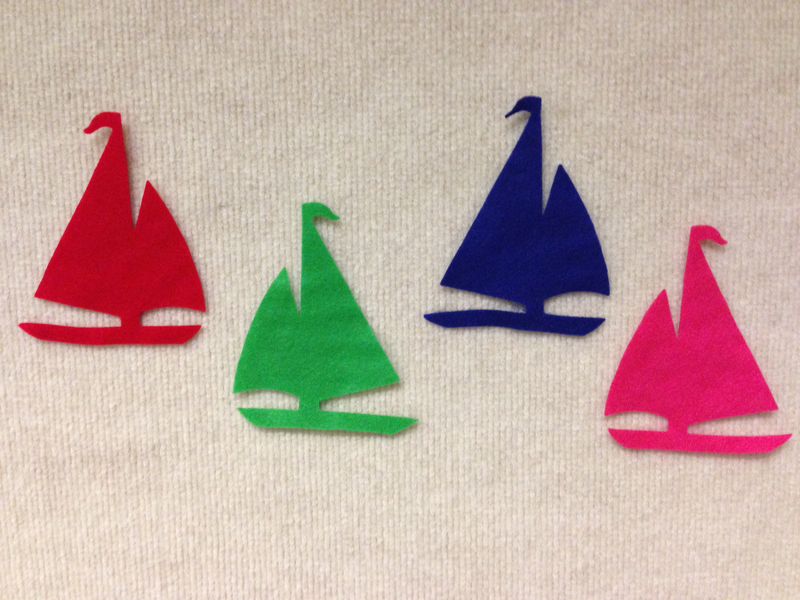 I put up a different color sailboat for each verse. 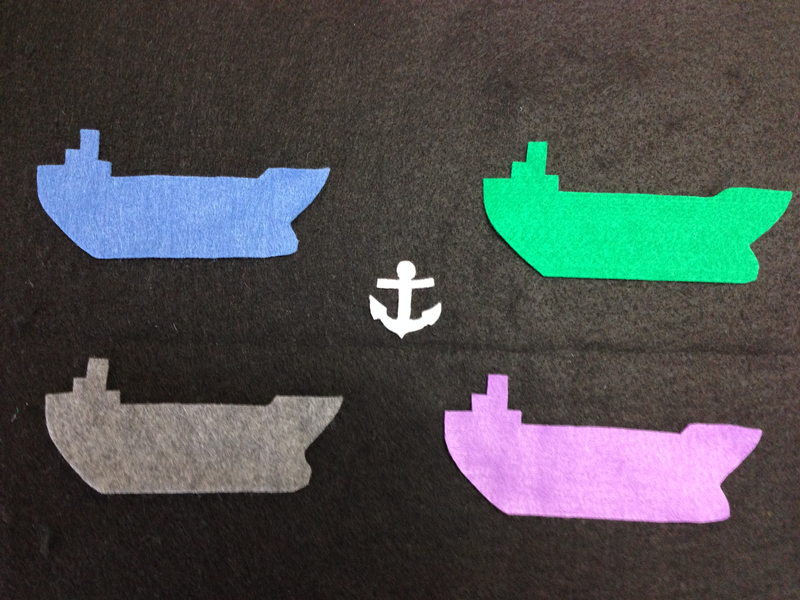 We have a sailboat shaped die-cut so making the sailboats was super easy. Merrily merrily merrily merrily life is but a dream. If you see a crocodile, don’t forget to scream! AHH!!!! 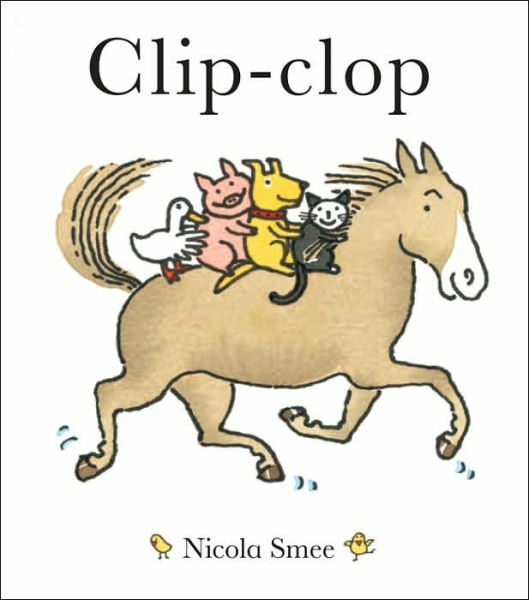 This week we read stories about horses! We sang the song a few times, getting faster and faster! I got this idea from Storytime Katie. I laminated different colored horses, put a little velcro on the back, and gave one to each child. 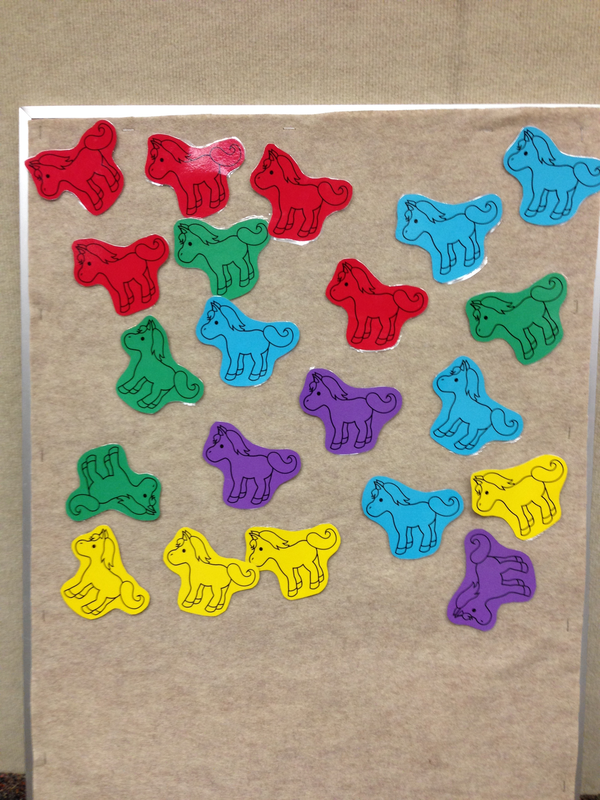 I told them to wait until I called their color horse and then they could come up and put it on the board. This is so hard for them! It’s too exciting to wait! 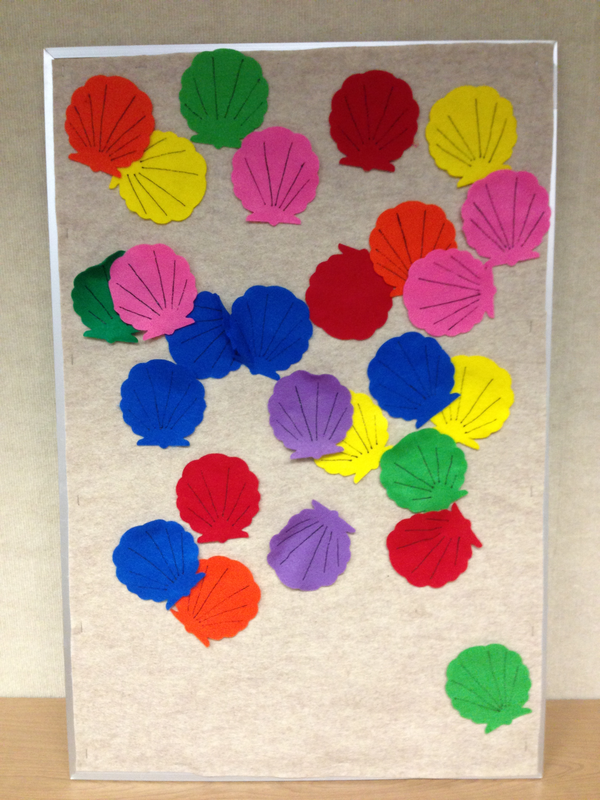 We did a similar activity last week with shells and this time they did honestly get a little better at waiting for their turn. One little trick I do when a kid comes up with the wrong color is to say “Oh how cool! But your horse is yellow not blue. 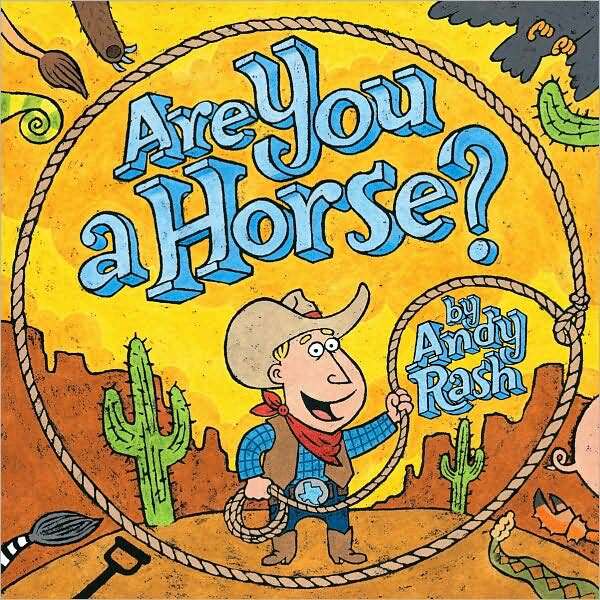 Can you go show it to your grown-up until I call the yellow horses up?” This works some of the time! Gallop it on your shoe! We’ll all come out and greet her,…. The chords I used can be found here. I have no natural music ability and I make lots of mistakes but the kids seem to still enjoy it. Jason Poole, a good friend and children’s librarian (who also happens to be a wonderful musician) told me that it’s good for kids to see you make mistakes. It lets them know that adults aren’t perfect either and the important thing is to not give up! I can’t stand the snow anymore! We’ve had 72.7 inches in Rochester this winter so far. 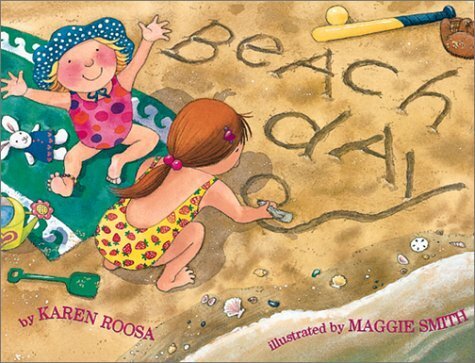 So I decided to go with a beach themed storytime. I thought about putting out beach towels for the kids to sit on but I don’t own enough. Maybe next time I’ll ask the parents to bring their own – BYOBT! Sign Language: Word of the day was “Beach” and we repeated it often. and I took it home! The waves on the sea go up and down all day long. 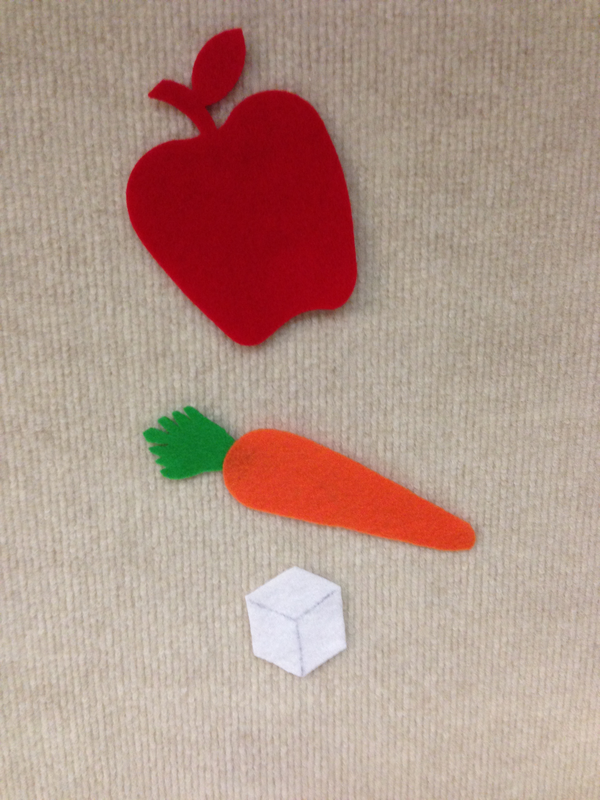 I added got the idea for this felt board (and the clipart!) from Storytime Secrets. I put the pieces on the board as I recited the song. I paused each time I put another piece up so the kids could shout out the correct word. We’re going to the beach. I think we’ll see some flip-flops there! I think we’ll see a castle there! I think we’ll see a starfish there! I think we’ll see a beach ball there! I think we’ll see a seashell there! 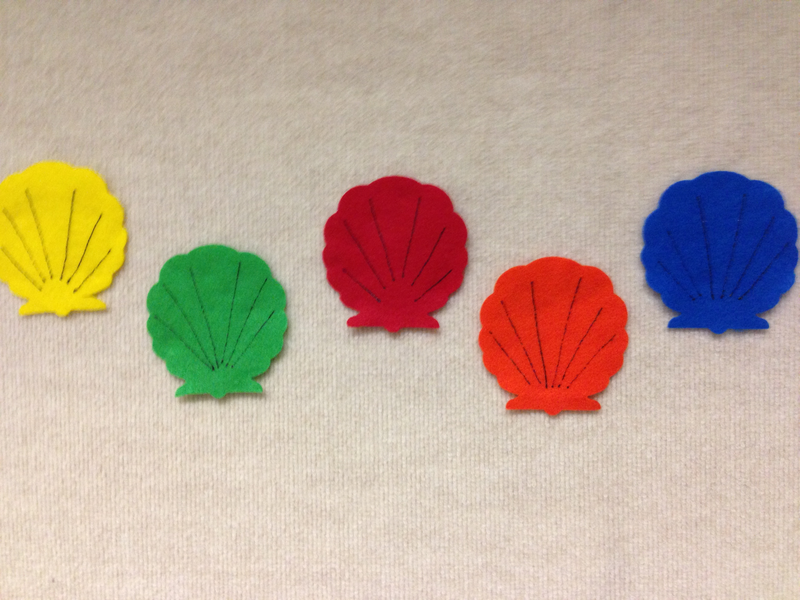 “There are so many shells in the hot, hot, sand. What color shell is in my hand?